Grants are awarded to undergraduate students based upon financial need and enrollment status. 2018-2019 Pell Grants range from $652 to $6,095 per year. Students who have earned a Bachelor's or Professional Degree are not eligible to receive a Pell Grant. Pell funds may only be received at one institution during any given period of enrollment. Concurrent enrollment at two or more institutions is not allowed unless a consortium agreement has been arranged. 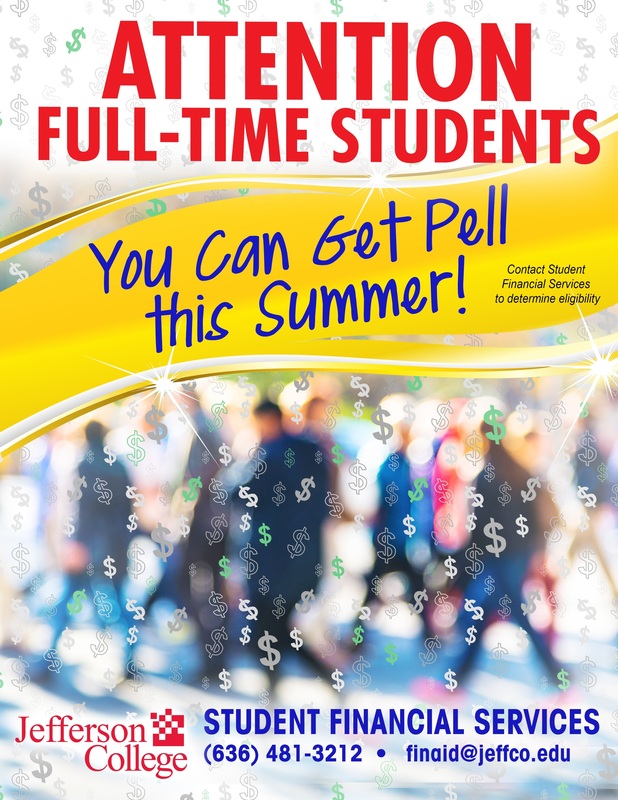 Pell Grant eligibility is determined by completing the Free Application for Federal Student Aid (FAFSA). For information regarding the FAFSA application visit www.fafsa.ed.gov. The Jefferson College Title IV School Code is 002468. Summer 2019 is part of the 2018-2019 award year. YEAR ROUND PELL IS BACK! Federal Supplemental Educational Opportunity Grants (SEOG) provide aid to students with exceptional unmet need. Students must qualify for a Pell Grant to be eligible for SEOG, but unlike Pell Grants, SEOG awards are not automatic. SEOG award priority is given to students with the lowest expected family contribution (EFC of 0) and highest unmet need who complete a FAFSA by Jefferson College's priority processing date of June 1st. Because funding is limited, only approximately 325 SEOG awards are issued to Jefferson College students each year. Full-time students awarded SEOG receive $400 per year. SEOG awards are then prorated based on the student’s enrollment level: 100% for full-time, 75% for 3/4 time, 50% for 1/2 time, and 25% for < 1/2 time. SEOG awards are typcially made in two disbursements (Fall-Spring or Spring-Summer). Funded by the State of Missouri, the Access Missouri Grant provides educational assistance to residents of the State of Missouri. Eligibility is determined by the student's expected family contribution (EFC) as calculated through the Free Application for Federal Student Aid (FAFSA). Recipients must demonstrate unmet financial need, maintain satisfactory academic progress, and be enrolled as a full-time student in an eligible degree program at a participating Missouri school. Effective 2018-2019, financial aid applicants that filed the FAFSA prior to February 1 and listed Missouri as their state of legal residence will be considered for the award. Due to earlier availability of the FAFSA, the State of Missouri priority date is now earlier! Award amounts vary by aid year and school. At Jefferson College, the 2018-2019 award amount is a maximum of $940 per year ($470 per semester). Eligible applicants with an EFC above $7,000 may have a reduced award. If a previous Access Missouri recipient, must maintain a cumulative 2.5 gpa, be making satisfactory academic progress, and not have used Access Missouri funds for more than 5 semesters. Students receiving Missouri A+ Program funds will have their Access Missouri Award reduced by the amount of their A+ award, so most A+ recipients do not receive the State's Access Missouri grant.